Aircraft Lighting International's LED replacement lights can fit almost any business jet, says the company. Aircraft Lighting International (ALI; Booth 668), maker of LED drop-in replacement bulbs for legacy fluorescent cabin lights, is showcasing new LED lights along with its current line of 28 VDC L-Series and 115 VAC LED lamps. ALI’s direct replacement lamps “can go into virtually any business jet that has original AE or B/E lighting, without modification,” said ALI general manager Shervin Rezaie, and the lights can be operated through the original control interfaces. The company has FAA-approved PMA replacement lamps for more than 70 business aircraft models, including BBJs and ACJs, from all major OEMs. ALI also custom makes curved bulbs for use in galleys, lavatories and VIP cabin fixtures. Here at the show ALI is introducing a King Air exterior wing light and square lamp. Also on display are replacement lamps for out-of-production, decade-old LED systems. “We have plug-and-play systems available to alleviate the headaches those customers are dealing with,” Rezaie said. 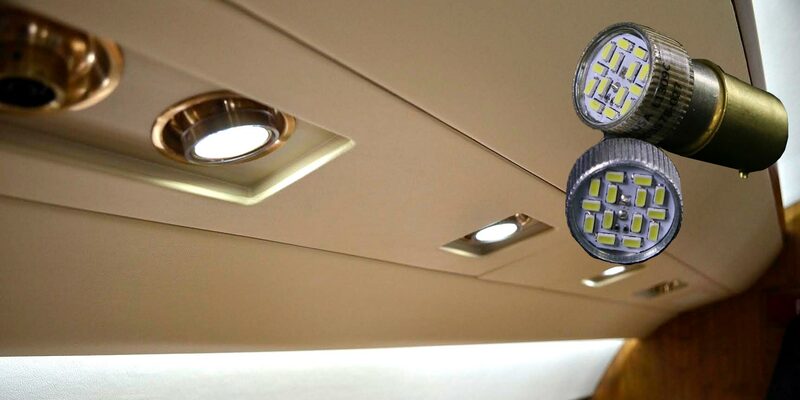 Among the legacy LED replacements: a new PMA plug-and-play lamp for 5800 LED series cabin lighting originally made for the Gulfstream GIV, GV and G200. Meanwhile, a mood-lighting system, controllable via iOS and Android smart devices, is ready for certification, while wing and logo lamps and ice lights adapted from company PMA reading lamps are expected to receive approval in 2017. Rezaie said that LED replacements eliminate the ballasts that fluorescents require, saving weight and reducing maintenance costs. Ballasts, which regulate current to fixtures, can weigh close to two pounds each, and a Challenger 601, for example, might have 16 to 18 such fixtures, Rezaie said. “You can likely get another carry on bag onboard,” through the increase in useful load provided by removing the ballasts. Moreover, old fluorescent systems can “eat bulbs,” he said, as the lamps often burn out quickly. ALI’s LEDs have a three-year warranty and typically last far longer, according to Rezaie. “We have yet to receive a lamp with an LED diode failure, because we’re operating at cool thresholds that allow for color consistency.” The improvement in the quality of light alone can justify a switchover, he added. Made of plastic rather than fluorescents’ glass, LEDs are also more durable and draw much less power. Additionally, lighting systems with ballasts are innately more time consuming to troubleshoot, Rezaie noted; an inoperative light could be caused by a burned-out lamp or a problem in the ballast. But for customers that simply want to change bulbs, Ali also produces 12-mm replacement fluorescent lamps.